The new GalepX script language makes it easy to integrate GALEP systems in production lines for in-socket or in-system bulk programming. 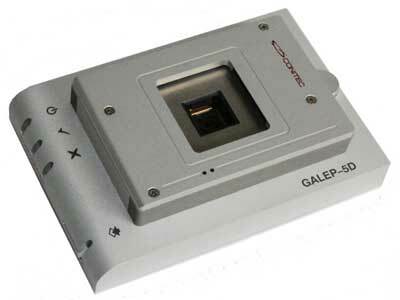 Any number of GALEP programmers can be combined to a gang programmer, controlled by SPS lines or the LAN. The script language allows the easy creation of a self-defined or customized user interface. This way you can quickly create your own mass programming system from single GALEP programmers. Alternatively, we provide individual solutions for programming stations - manually operated or fully automatic, equipped either with socket modules, ISP interfaces, or needle adapters (see image below), with 4, 6, or 10 programmers. Contact us for a quote! 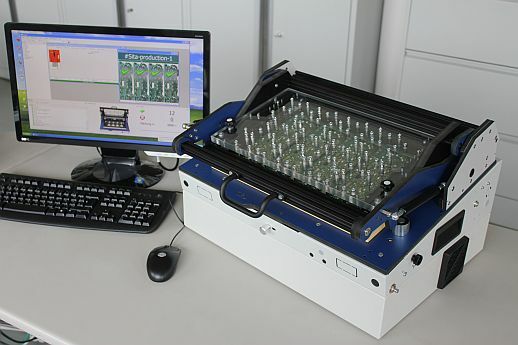 We offer an individual setup service for in-circuit programming your boards with GALEP-5 und GALEP-5D. Send us board and circuit diagram and we'll deliver a customized programming system including adapter and connection cable to the board. 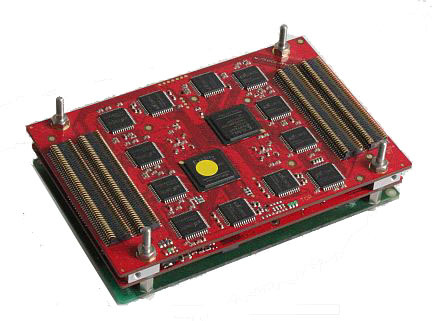 For mass production, the ARM-9 controlled GALEP-5F programming module can be easily integrated into existing machines or production lines or operate autonomously. The GALEP-5F programming module has the same connections and features as the GALEP-5D programmer and supports the same socket modules. To adapt a socket module to GALEP-5F, just remove the top aluminium plate and place the socket module board onto the 4 bolts of the programming module. All GALEP-5D/5F socket modules are available with an optional remote controlled self-opening mechanism (prices upon request). The socket closes automatically when a device is inserted, and opens when the device is programmed and can be removed. Self opening socket modules allow, for instance, a GALEP-5D/5F system to program devices directly while the boards are assembled in pick & place machines. This reduces production time and costs remarkably.